This cute little cottage is the perfect getaway for those who love the Florida outdoors. It is called the Dragonfly Cottage and is located just off the Suwanee River in Fanning Springs Florida. Fronting Bell Spring, one of the counties 63 beautiful springs; it is the ideal spot for swimming, kayaking, canoeing and paddle boarding. Called Florida's nature Coast; there is also an impressive network of bicycle trails close by, as well as quaint Gulf coast communities like Steinhatchee, Suwanee and Cedar Key. Enjoy 1.5 acres of spring front property with majestic live oak trees, a canoe & kayak launch, dock, and fire pit.The cottage itself is a tiny 256 sq. ft. under air but includes big amenities like a separate bedroom with a queen size bed and cozy fireplace, and a full bath with a corner shower. A cute little dining table for two and everything you need to cook with is included. There is a full size refrigerator, microwave, two burner hotplate, electric skillet and griddle, large crock pot, blender and a toaster/oven large enough to bake a cake. Outside, there is a great outdoor shower stall for rinsing off after a long day of outdoor activities, and watching the sun go down while sitting in the Adirondack chairs on the covered porch is the best place to enjoy a glass of wine at the end of the day. This unique little cottage got its start as a 10’x12’ storage shed used to store tents, tools, and other items needed to cleanup, and maintain the dock and property. Built mainly out of necessity with the outdoor shower stall being it’s first addition; over time the shed evolved into the cottage you see today. A small window unit provided AC in the summer and a space heater took care of the heat in the winter. Over the next few years, the cottage became a labor of love for my late husband and me, with the addition of the indoor bathroom and then a small bedroom. The covered front porch is the final addition providing a wonderful space to relax and enjoy a glass of wine after a long day of outdoor adventure. Private, Secluded, cozy spring front retreat but keep in mind nature is unpredictable. It does rain in Florida, sometimes nearly everyday, but usually only for a short period of time. 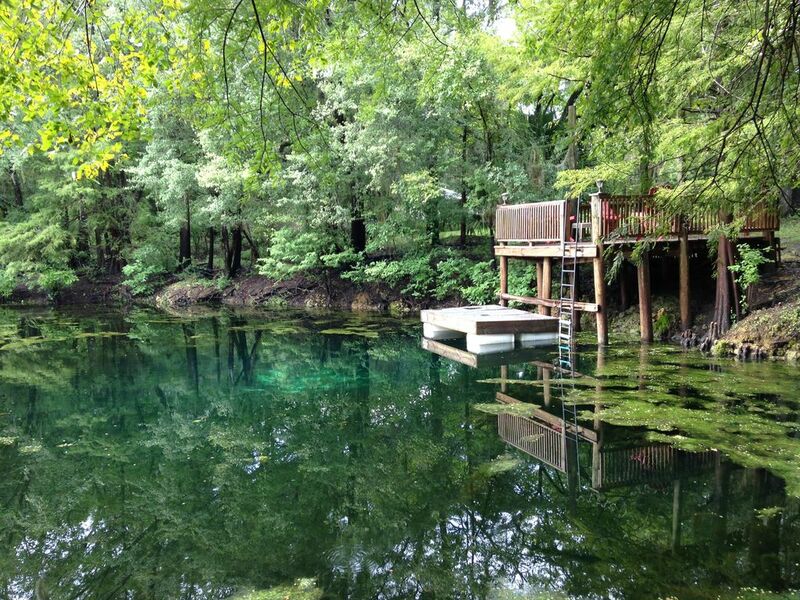 All Florida springs are effected daily by the waterways they are connected to. The Suwanee River and its tributaries experience minimal water level changes with the daily Gulf tide and rain levels. Occasionally, if the rain levels are significant upriver, even as far as the Okefenokee swamp in Georgia; the river levels will rise pushing the river water (brown water) and sometimes aquatic vegetation into the tributaries temporarily covering our springs. This does not effect kayaking or canoeing but you may choose to swim a few miles south at Manatee Springs where the ground elevation is a little higher and the springs are rarely impacted by higher water levels. To monitor the water levels in our area go to real-time river levels on the internet. Scroll down to the Suwannee river and click the Wilcox station. This will give you the river levels for the last 30 days. A good reference number for clear swimming in our spring would be about 4 feet or under. If this is important to you please monitor the levels because I will not be able to provide a refund due to elements beyond my control. Full size bath with a corner glass shower enclosure. There is also a roomy outdoor shower enclosure with a bench, utility sink & hot & cold water. Bath, beach & dish towels provided. Living room is part of the kitchen dining area. Features a 60” bench sofa that converts to a full size bed if needed. toaster/ oven large enough to cook two pizzas at one time. All dishes and utensils provides. This includes coffee mugs and wine glasses. Even though there are no full size or built in appliances with exception of the refrigerator, this kitchen is fully functional for almost all you cooking needs. Small 36” round dining table with two chairs. A whimsical chandelier with a dragonfly adds to the cottage’s charm. Small 19” television with access to local stations. Extensive DVD video library is with a variety of genres is provided. One man's and one woman's trail bicycles provided. A same day turnover is not possible on Saturdays because housekeeping is not available. Please keep this information in mind when requesting a booking. Thank you. Nice spot by beautiful Little Belle spring with canoes and kayaks available. Has bikes to use on a nearby bike trail. Shower has a lot to be desired, erratic hot/cold and water pressure. The bed needs new bedding. Tiny house but very cute. Renee Thank you for your review. My goal is to make your stay as pleasant as possible and I will address the shower issue. Could you tell me if you are talking about the inside or outside shower? If you need to chill the dragonfly cottage will fit the bill! Loved this place. Very cute cabin. Would love to come back when the river is not flooded into it. I will be back! It was peaceful. I gave it a 4 because there was not a place to store our clothing during our stay--that being said, if I knew how to do it, I would have given it a 4.75. Extremely clean, and wonderful stay. Well worth it. We plan to be back next winter. I reserved The Dragon Fly Cottage for my wife and I to spend a weekend away while NaNa watched the kids :) We really enjoyed taking the canoe out and sitting by the firepit at night. Deborah, the owner, was incredibly kind and considerate throughout all of our correspondences. The cabin itself was plenty spacious for my wife and I, and had all the amenities (and more!) that you could need for your stay. Thanks for a great weekend!